With a crazy full time university load as well as my regular full time day job I’ve spent a lot of the chilly season in work clothes, active wear and pyjamas. But the times I have been free and out and about I’ve embraced all of the colour, fun accessories and classic pieces perfect for the upcoming season. 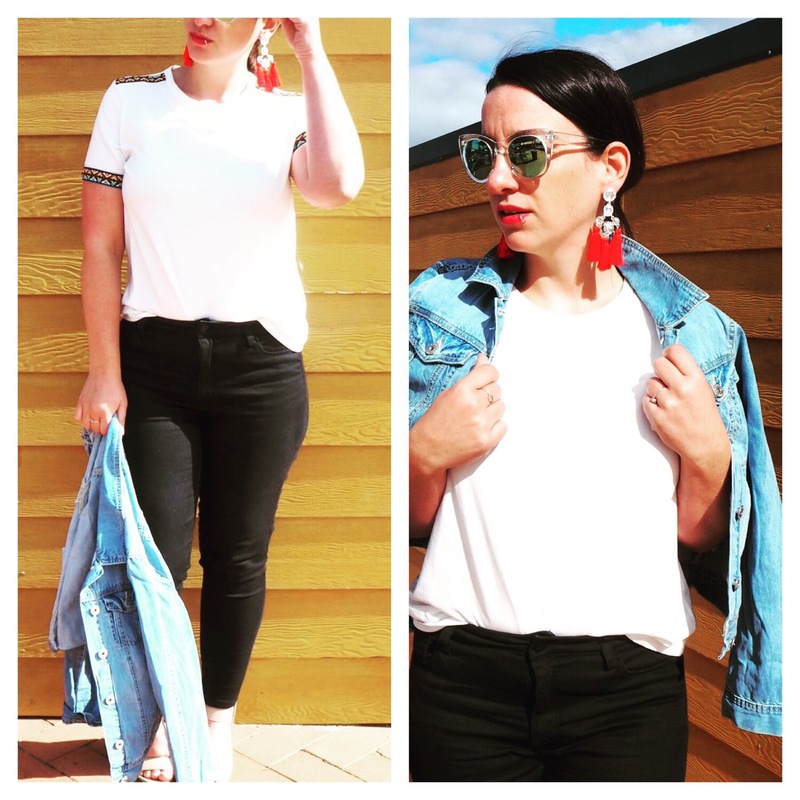 I’ve collaborated with a few brands over the course of Autumn including Harris Scarfe (they’ve just opened a new store in Joondalup in Perth) and SheIn for a bit of wardrobe update. I’ve shared those pieces I picked up today, plus my own favourite goodies. Notice the vibrant colour and prints galore – this girl isn’t changing anytime soon! If you’re looking for something specific I’ve added a few links for those items still around so you can shop my favourite pieces I’ve worn this month. I picked up this black t-shirt midi dress on our most recent trip to KL, and I’ve lived in it ever since. It’s simple, works well with sneakers and is super comfortable. I can’t wait to layer it up for Winter with a denim jacket and a fun print scarf, but since the sun is still around at the moment it’s so easy to chuck on for an easy look. 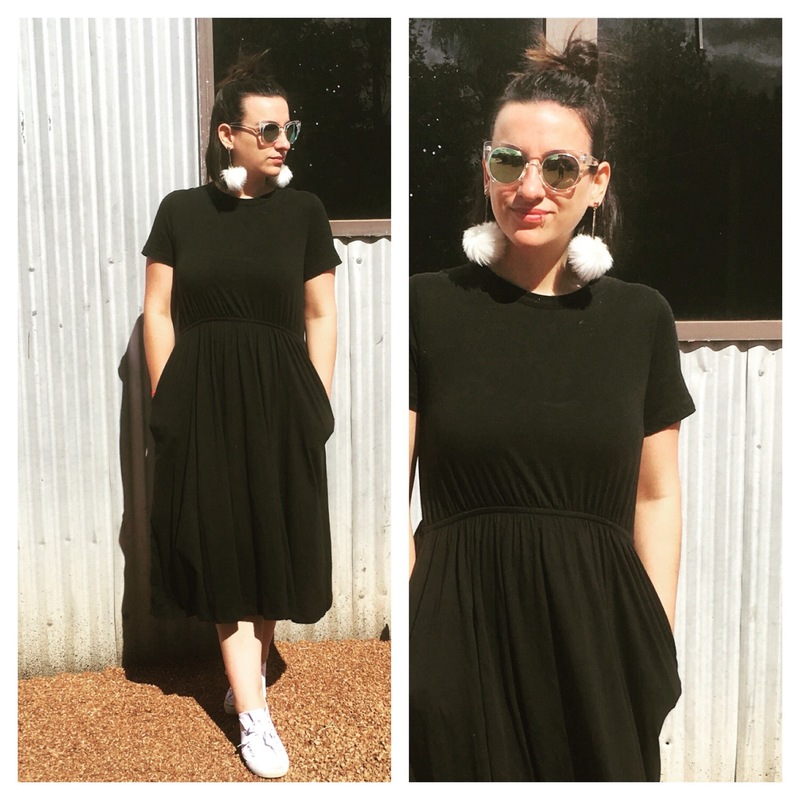 I paired this dress with my bargain white Kmart sneakers (they’re only $3.50 guys!) and some fun fluff earrings. Statement earrings really complete an outfit so if you’re a fan of these Lovisa gems, get in quick because they’re selling like hot cakes! Oh Harris Scarfe, I’m so happy you’ve returned to Perth. 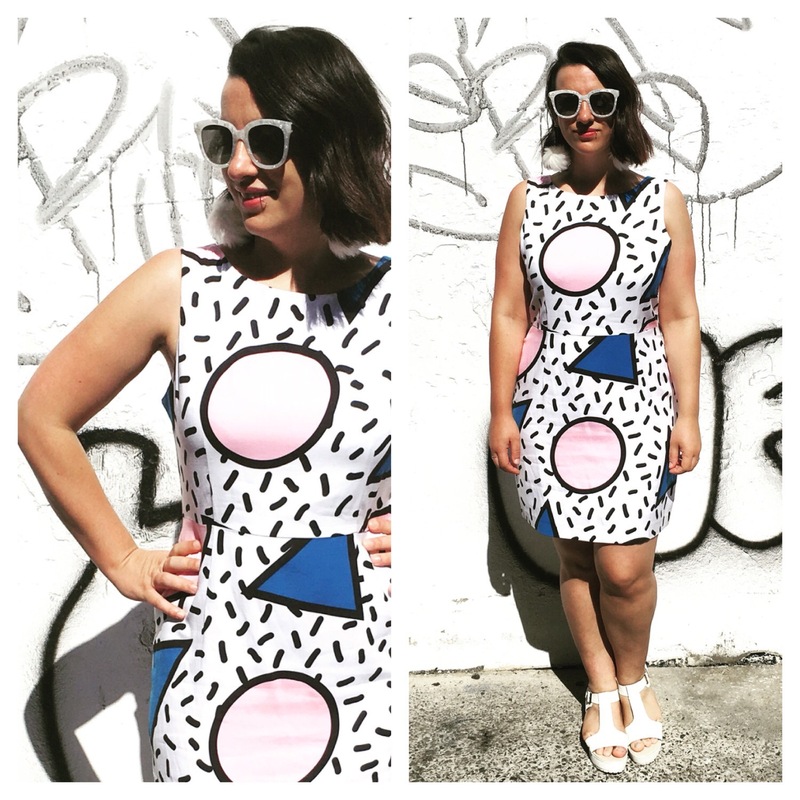 I picked up this gorgeous printed Winter work dress at the new Harris Scarfe store last month. The fabric is luxe, the print is fun and it’s a nice alternative to my usual pants and blouse combo for work. Unfortunately this one is sold out online but if you pop into Harris Scarfe you may find it on the rack. A little birdy told me they have a wonderful sale on at the moment too, so you may bag yourself a bargain! I’ve pretty much become a Gorman Girl over the last few months since I bagged this dress for half the price at my local Gorman outlet. I’ve always been obsessed with the cute quirky factor of the Gorman range but the price point held me back. Luckily you can shop outlet or second hand with this label! eBay has been great for finding Gorman at a fraction of the cost too – plus it’s always better to thrift shop! I live in a tee and jeans combination on the weekend, and that is why I love this statement tee from SheIn. The embroidered pattern on the neckline and arms add a little something to a plain white tee, and the embroidery is totally on trend. I paired this look with a fabulous pair of Ruby & Lilli earrings and a cool light denim jacket picked up at Cockburn Shopping Centre. Easy and fun! 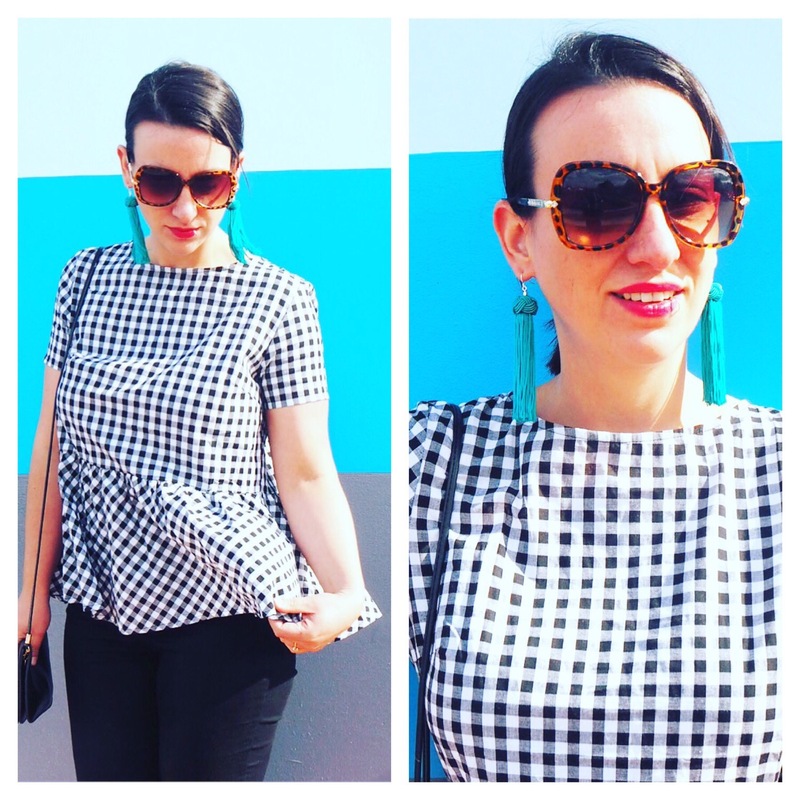 Gingham is another current trend that I’m obsessed with. I’ve always been a plaid fan but there is just something about these dainty little checks that I love. This SheIn top speaks for itself. It’s classy yet still fun and ties up at the back with super cute ribbons. Perfect for work and play! This is my first OTS top guys! I’m regretting not getting into the trend sooner. 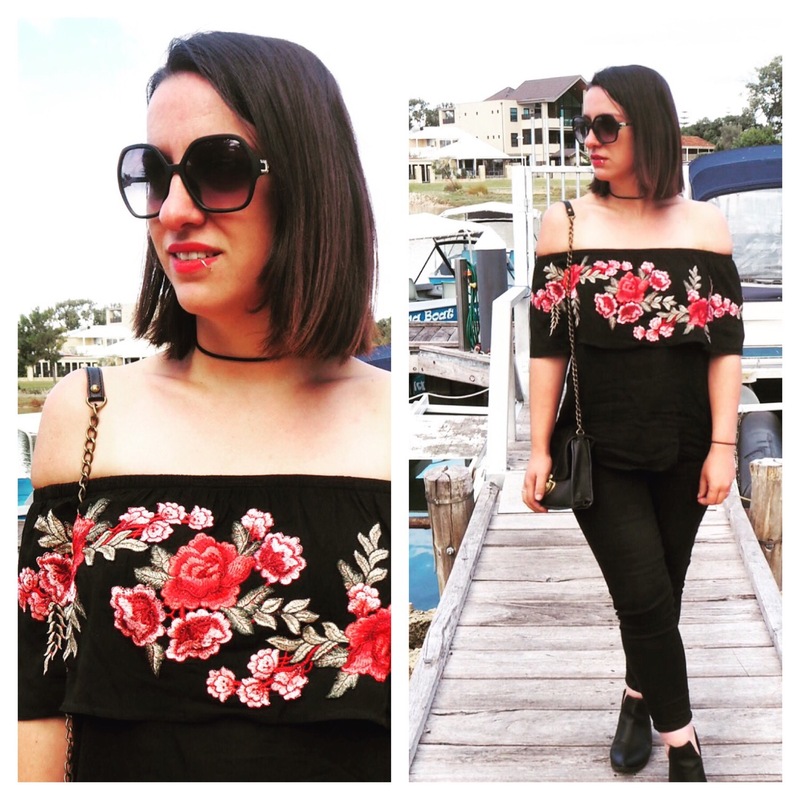 I fell hard for the rose embroidery print on this SheIn top. It’s flattering, easy to wear and really speaks for itself. I paired this top with simple black skinny jeans and a cute choker to let the top do the talking. I can’t wait to take this one out again soon! You can’t do Winter in Perth without a collection of knits, and this Harris Scarfe knit is something special! The white shirt pictured is actually attached, adding another element to the simple knit. 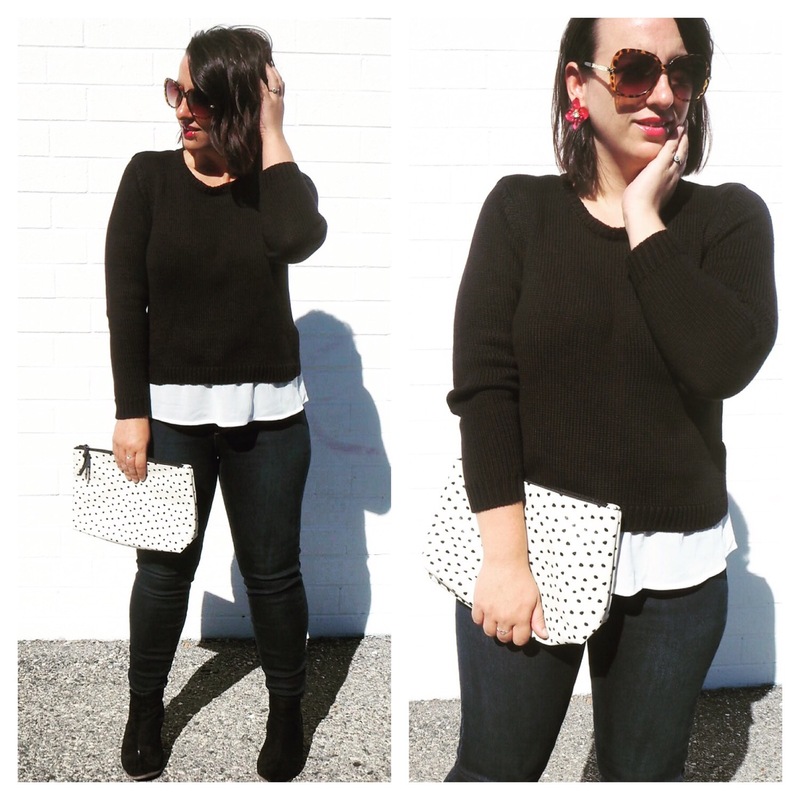 How cute is this polka dot clutch by the way? It’s currently on sale so get in quick if you’re a fan! 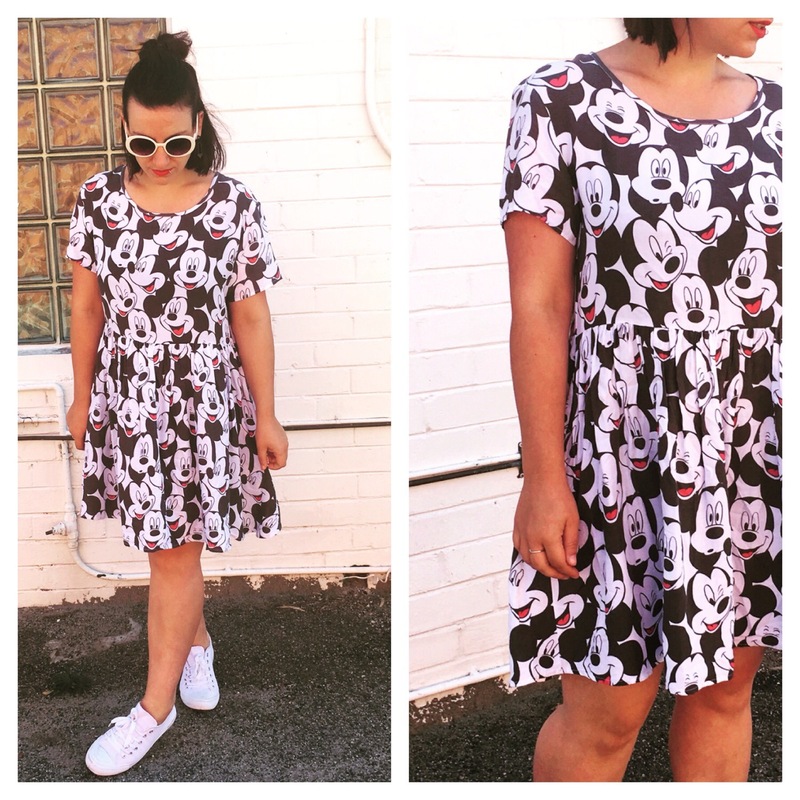 My partner laughed at me when I purchased this Mickey Mouse print dress. It’s definitely something our 2 year old niece would wear, but I just loved it! Big W has plenty of cool Disney themed collaboration pieces in store at the moment, and I proudly wore this one out last month for breakfast. Who says a 29 year old can’t wear a Mickey dress? 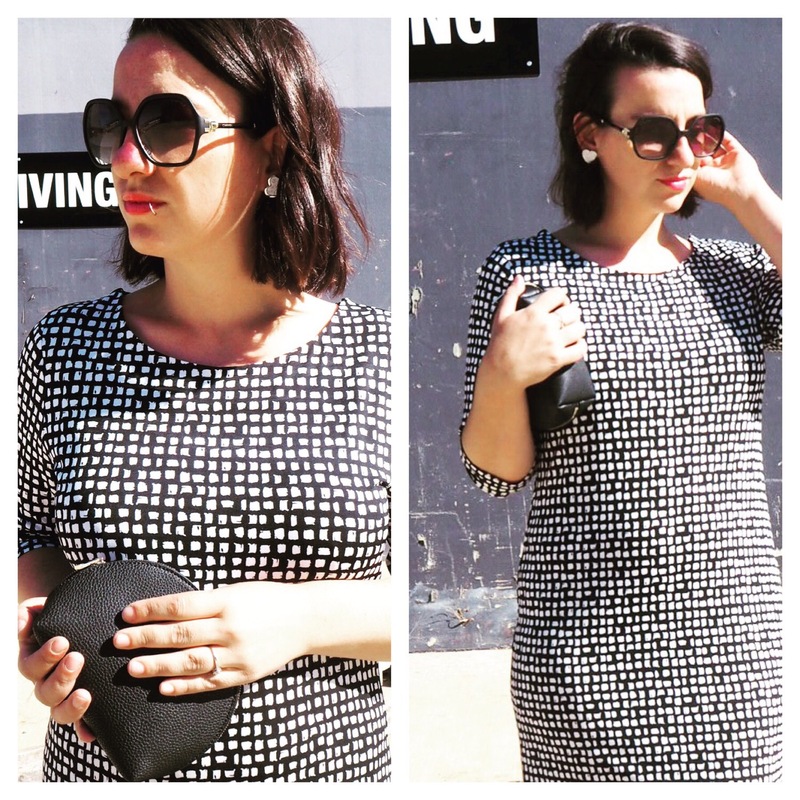 What have you been wearing this season? * I accumulate a bunch of PR samples and gifted product thanks to the blog, and I like to try out and test what I receive, sharing the best bits with you guys so you too can discover new brands and services. I will only share the products I have faith in and actually love as per my disclosure policy. Items marked with a * gifted for my review – all opinions are honest and my own. Love every single outfit !! Thanks T! So do I ! I’m Gorman obsessed right now!!! Still love that Gorman on you! She is such a legend, one of the most interesting street artists and I daresay the best collab Gorman have done! Thanks honey! It really was a beautiful collab!